In the 1950s “nuclear” was the most often term used. During the development of the Valkyrie, a number of studies were started to explore the possibility of nuclear powered aircraft. The Air Research and Development Command issued an order for a strategic bomber capable of Mach 0.9 cruise speeds and “maximum possible” speed during a 1000 mile entrance and exit from target. The problem with such a design was the enormous fuel consumption of jet engines at the time. In order to carry a considerable nuclear payload from the United States to the heart of the USSR, a supersonic strategic bomber would have to carry at least three times more fuel than the sub-sonic B-52 Stratofortress. Another problem that designers encountered was the high temperature resulting from friction. Conventional subsonic aircraft use an aluminum alloy, duraluminum as the base material for the structure. However, above Mach 2.2 this material becomes plastic, and is no longer suitable for operations at higher speed. Because of the recent advances in Russian interceptor aircraft, capable of operating at speeds nearing Mach 3, it was considered that a future strategic bomber would have to match, if not surpass this value. Other important aspects that needed to be taken into consideration were intake design, jet engines and the problems of operating at supersonic speed for extended periods. It was discovered that an aircraft operating at high supersonic speed could in fact have an operational range advantage. The main problem was drag, but most drag occurs during the trans-sonic range, ranging from around Mach 0.9 to Mach 1.2. Also, supersonic flight presents with other aerodynamic than subsonic flight. Due to the way lift is generated at supersonic speed, the lift/drag ratio drops. this in term leads to a greater fuel consumption and a decrease in range. One of the solution to overcoming all these problems was compression lift. Shock waves generated by the nose of the aircraft were sources of high pressure. Lift is obtained by having a pressure difference on the wing. Above, there is low pressure, and below there is high pressure. It was possible for an aircraft to obtain better lift by positioning the wing so that it received the high pressure generated by the shock waves. North American engineers also came up with another interesting solution: a set of drooping wing tip panels. This not only helped trap the shock wave, but also added more vertical surface to the aircraft when operating at high speeds, which was important in helping offset a general decrease in directional stability all aircraft encounter at high speeds. North American’s solution had an additional advantage, however, as it decreased the surface area of the rear of the wing when they were moved into their high speed position. This helped alleviate a more minor problem, the shift in center of pressure as speeds changed. Under normal conditions the “average lift point”, or center of pressure, moves rearward with increasing speeds, causing an increasing nose-down trim. By dropping the wingtips the wing was reshaped to have more area forward, offsetting this effect. On September 18, 1957, the USAF issued operational requirements for a high altitude supersonic strategic bomber. Some of the requirements were a cruise speed of Mach 3.2, operational ceiling between 70,000 and 75,000 feet, range of 10,500 miles and a gross weight of no more than 490,000 pounds. Boeing and North American competed to develop this aircraft and on December 23, 1957 North American was declared winner. The aircraft was assigned with the number B-70 and the name Valkyrie. The aircraft also received the “X” experimental prototype designation. Valkyrie comes from the Norse mythology. A valkyrie is a minor female deity that chooses the most heroic of those who die and carry them to Valhalla. Rolled out on May 11, 1964, the XB-70 Valkyrie made its maiden flight on September 21, 1964. 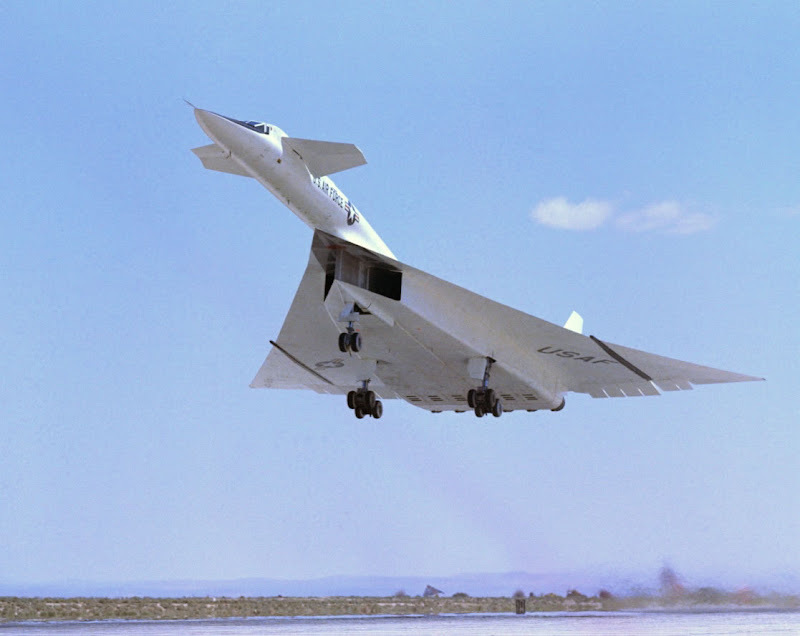 The aircraft reached supersonic speed on the third test flight and on March 24, 1965 Mach 2.14 was reached. All six engines of the prototype were damaged beyond repair on May 7 1965, after the divider separating the left and right halves of the engine inlet broke off and was ingested by the engines. A speed limit of Mach 2.5 was imposed for further flight tests, following another incident on October 14, 1965. The XB-70 Valkyrie reached a speed of Mach 3.2 at 70,000 feet but the structure was damaged and two feet of the leading edge on the left wing went missing. During a photo shoot for the General Electric company, on June 8, 1966, an F-104 Starfighter collided with the number two Valkyrie prototype, sending both planes to the ground. Following this disaster, the number one aircraft conducted 33 more test flights and was then handed over to NASA in March 1967. On 4 February 1969, Valkyrie number one was retired and flown to the National Museum of the United States Air Force at Wright-Patterson Air Force Base near Dayton, Ohio. Used only as a testbed for advanced aerodynamic and propulsion studies, the B-70 Valkyrie high altitude high speed strategic bomber was canceled in 1961 due to the developments of surface-to-air missiles and intercontinental ballistic missiles. The XB-70 Valkyrie remains a legend to this day. Had it entered production. it would have been the highest performance bomber ever built. Today, the Valkyrie is only a museum piece, but some of the technology used is amazing, even to this day. The Valkyrie was a Mach 3 capable, six engined, canard delta wing configuration built largely of stainless steel, sandwiched honeycomb panels, and titanium. In order to obtain a good lift/drag ratio, the aircraft was designed to use the phenomenon called “compression lift”. The shock wave generated by the airplane was trapped underneath the wing, increasing the pressure and thus the lift. Under the center of the wing, the Valkyrie featured a prominent wedge at the center of the engine inlets, designed to produce a strong shock wave. By acting upwards upon the wings, this shock wave would allow the aircraft to recover energy from its own wake. At high speeds, compression lift increased the lift of the wings by thirty percent, with no increase in drag. hey januz!!!! go duck yourself!!!!!!!!! pleeeeeze!!!!!!!!!!!!! Great name for a jet like that.